Warlord Trait - +1 VP for each Character my Warlord kills in combat. 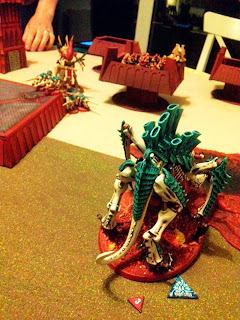 I had a stripped down list, no Doom, a Spore Pod with Devgaunts, 2 Tervigons, 2 Hive Guard, 2 Biovore and a Trygon for a change. 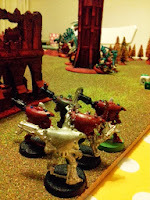 PeteB had a Couple of Vypers, 3 Jetbikes, 5 Wraith Guard, and Avatar, a Wraith Lord, bunch of Guardians and their Weapons platform and some Warp Spiders and an Exarch. 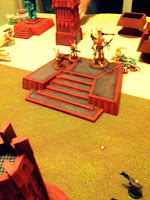 PeteB got to go first, my objective is in the ruin and PeteB's is inbetween the three outpost platforms at the back. and despite the cover were gunned down turn 1 - First Blood to PeteB! 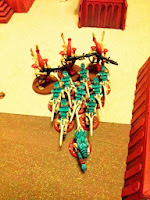 And paid the price with 3 wounds, it's amazing how lethal shuriken weapons and other Eldar weaponry can be. 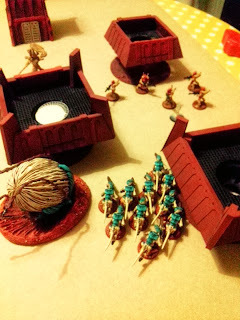 I was suddenly fearful like their Dark siblings make me and I hadn't even faced the Wraith Guards weaponry yet and that made me even more scared! 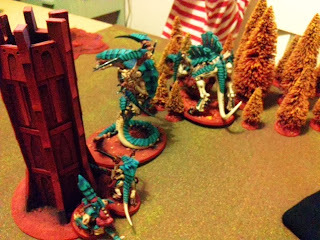 My turn and I spawned out on 10 for the plain Tervigon, typical as that's the side I had my objective, while the CC Tervigon spawned 8. 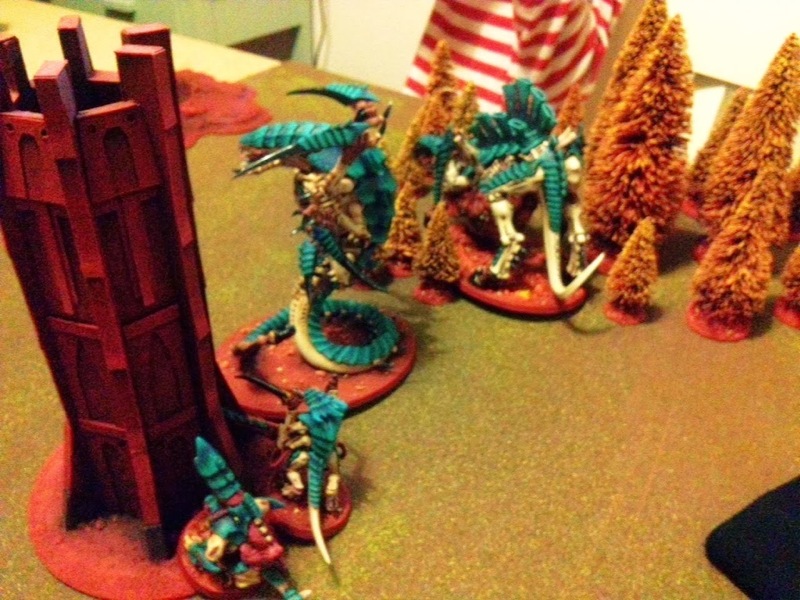 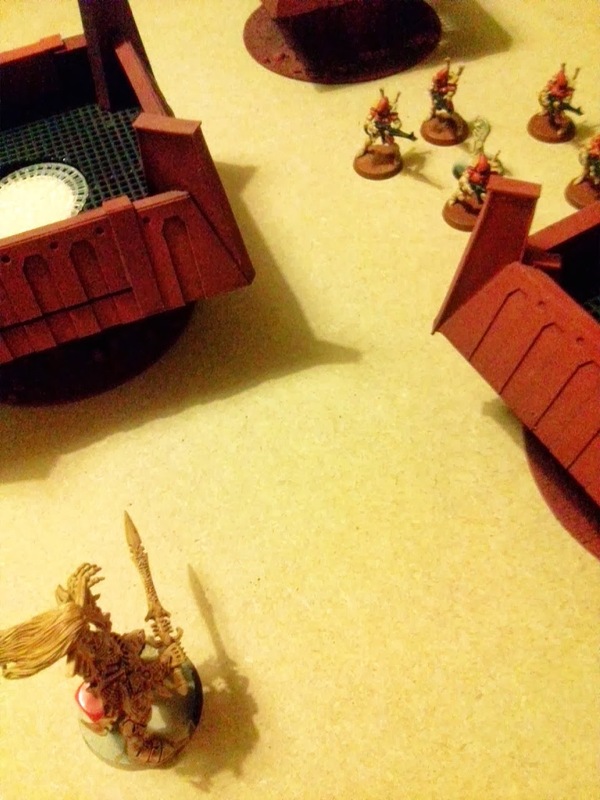 My gaunts and assorted shooters felled two Wraith Guard before 9 of their number made it into combat after overwatch. 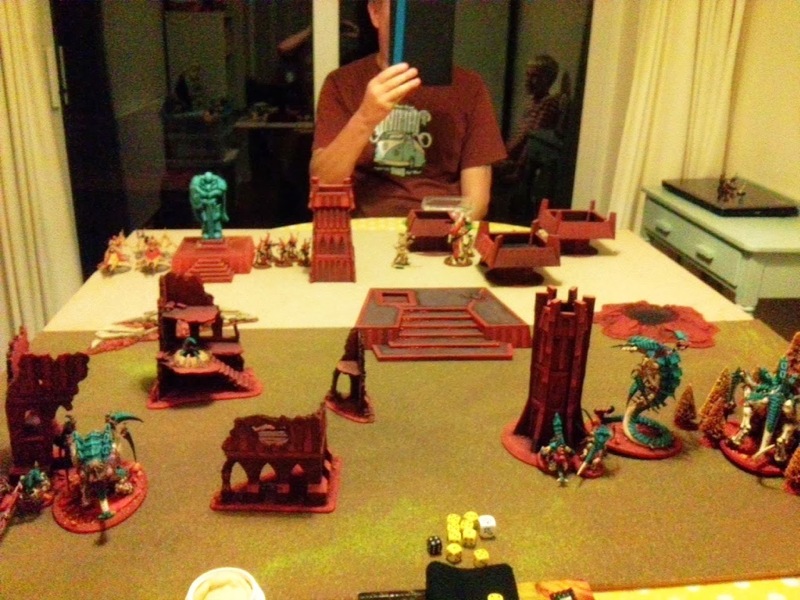 8 got to assault and I killed another for one loss. 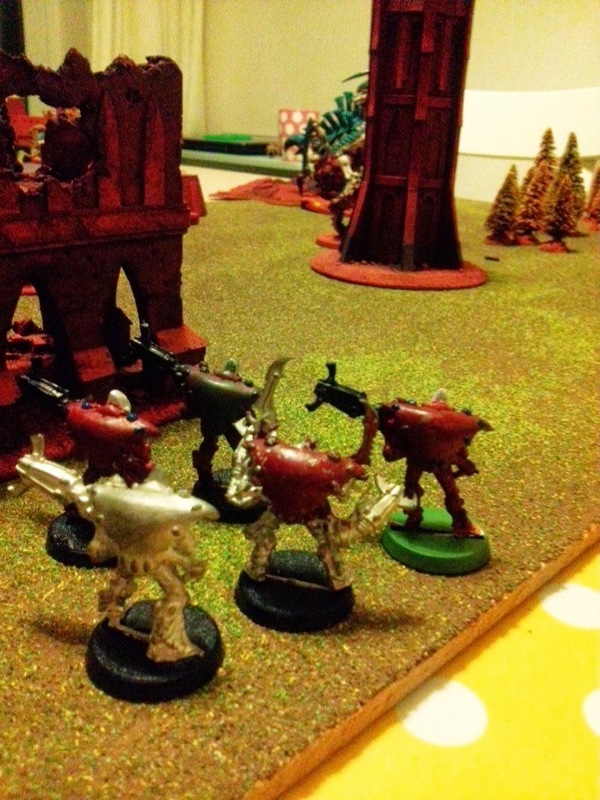 They remained locked in combat! 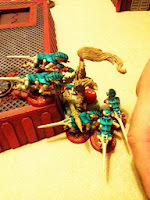 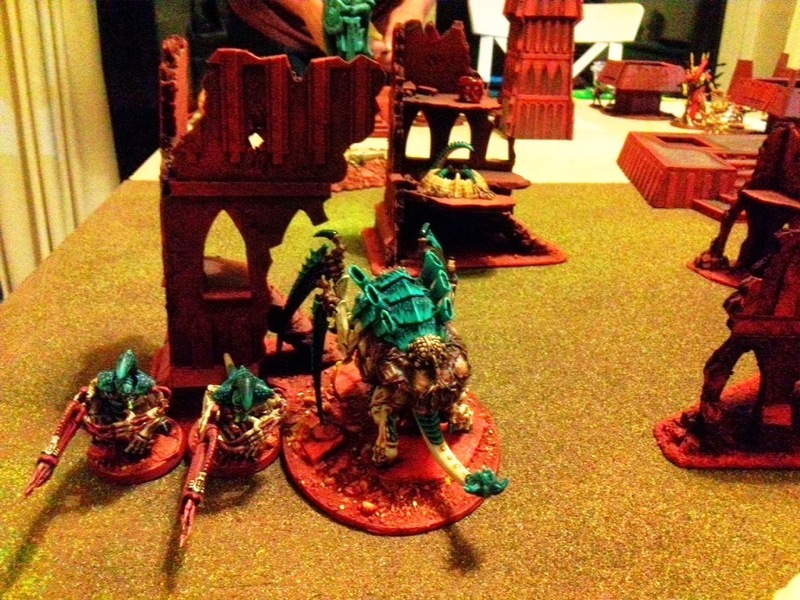 The Avatar was tar-pitted also and he'd taken a couple of wounds, which would have been better if the gaunts had just been in range by 1 more inch and benefitted from my Tervigon's Toxin Sacs - see that's why I don't take them if they can't keep that 6" range what's the point? 5 of their number remained at the end of my combat. Bzzzp, the Warp Spiders appeared, nearly off the board, despite the deviation they wiped the Biovores out of existence with some carefully placed shots. 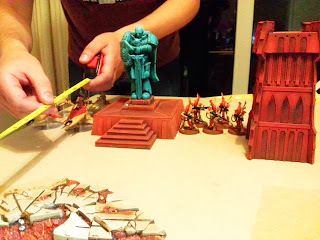 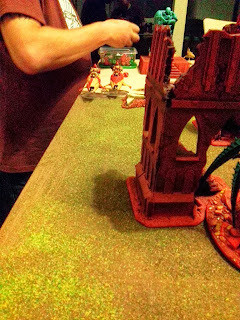 You can just make out the Trygon behind the tower, his move through cover was like 2-3" and his run move equally pathetic and fleet got me the same pitiful inch or two. 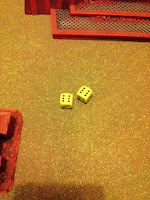 Fat and lazy - as always playing against PeteB. 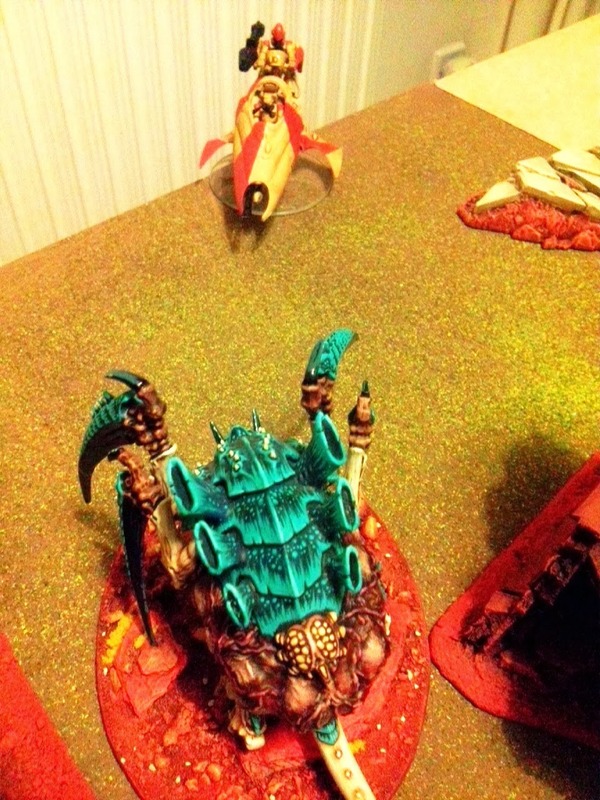 Even with Warp Speed the Tervigon was getting very far fast. 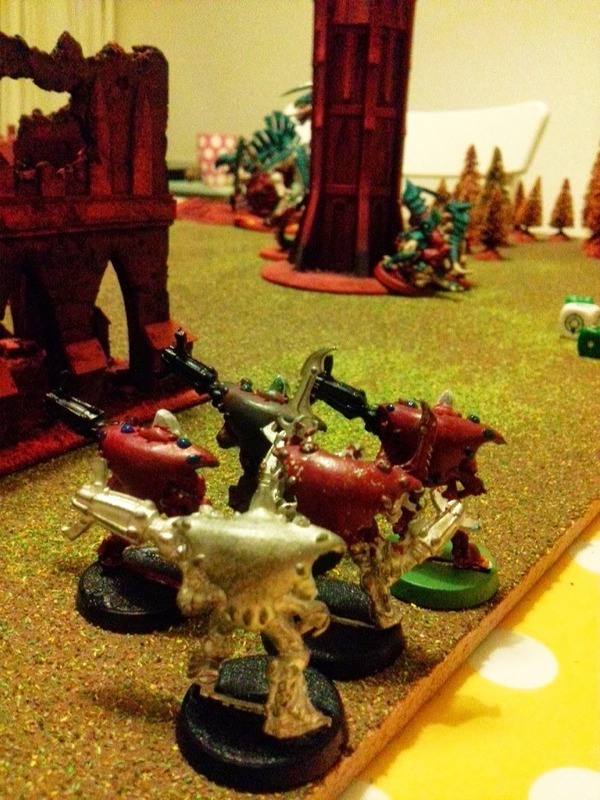 It took 3 wounds from the Guardian who I'd hoped to barrage with the Biovores next turn given their optimum bunching but that plan was obviously scuppered byt the Warp Spiders. 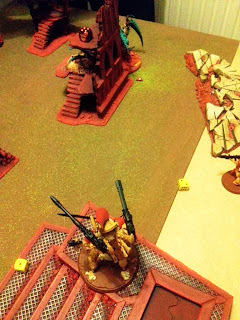 The Wraith Guard managed to kill off some of the Termagants who were then out of Synapse, failed morale and were over run. 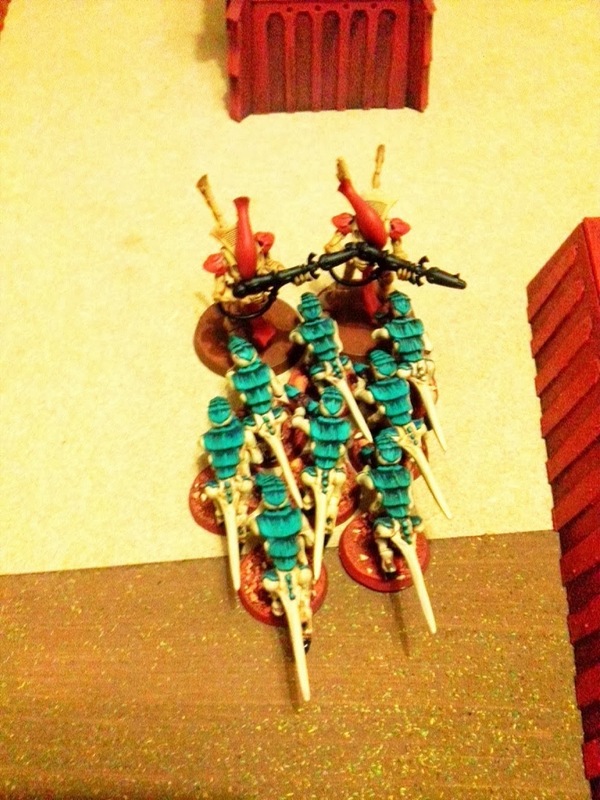 Jet bikes moved up to be a pain in the behind. 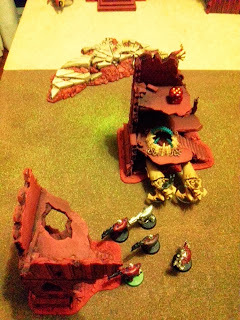 My turn 2 and things were dire, however th vanilla Tervigon managed Life Leech on a Vyper and got a 6 to pen and a 6 on the damage chart blowing it up. 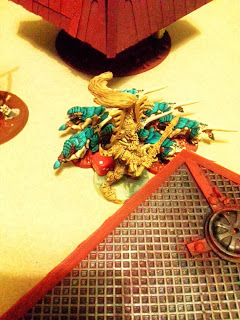 We debated whether that was possible on a vehicle but it doesn't stipulate it's not, its a weapon profile afterall but common sense would suggest no wounds could be replaced from such an attack as vehicles don't have wounds, not that it mattered my Tervigon was untouched at this point. Sadly the Stinger Salvo couldn't remove the other Vyper. 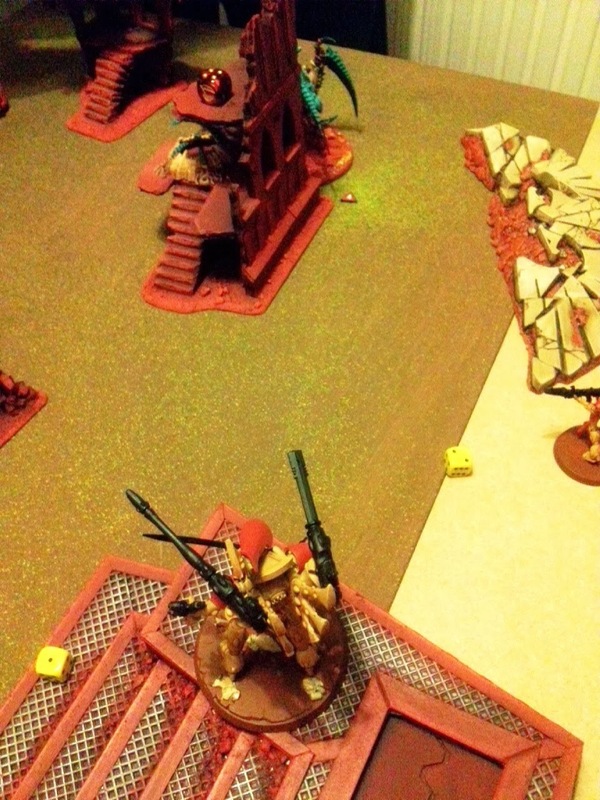 But in the following turn it was shredded by monafilament, Wratihlord weapons and shurikens! In my turn I'm still trying to work out if I can win, I still have the Spore Pod to come but it fails to arrive so I try and take out the Vyper, but think I fail. 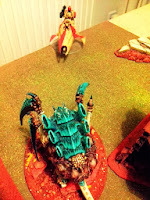 Warp Spiders put the hurt on the Tervigon. And the remaining Eldar take 4 wounds off, good rolling there. 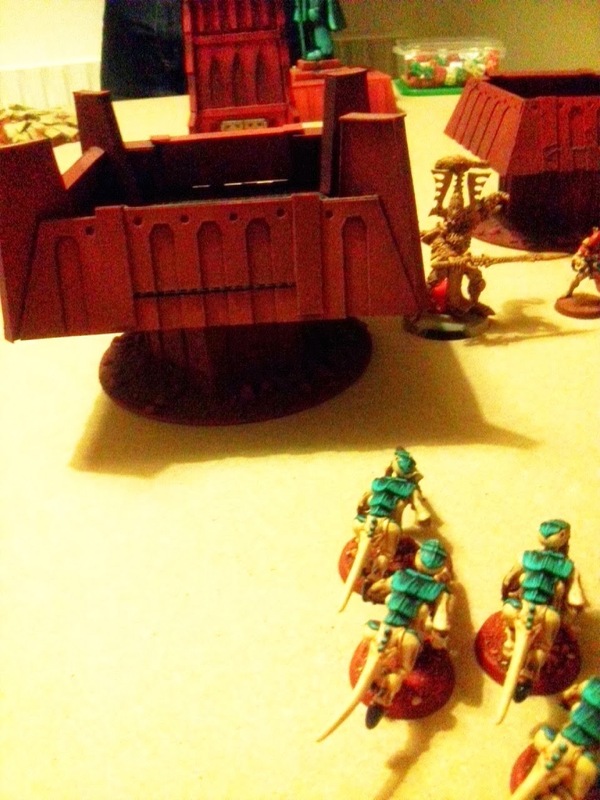 The pod arrives, finally, in the only place I can make a difference. 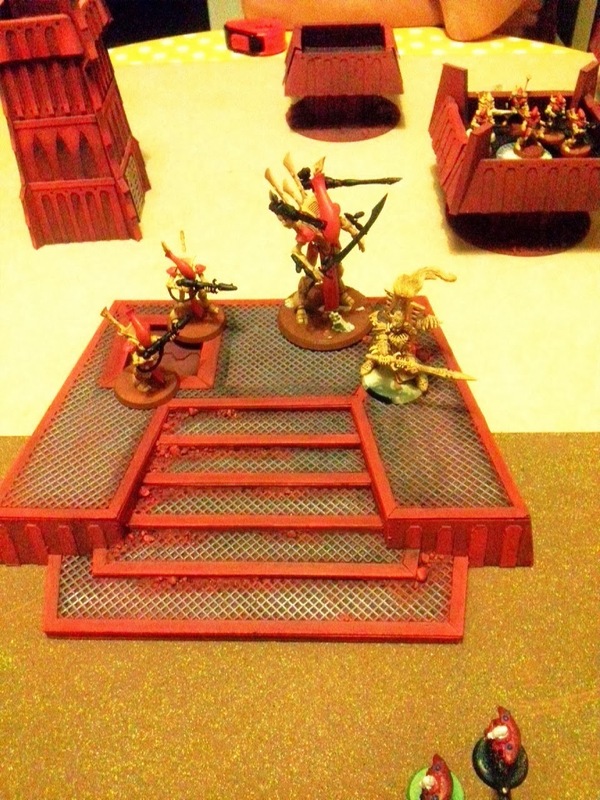 If I can shoot the guardians and they flee I can capture the objective, hopefully hold off the Avatar somehow and also get Line Breaker. 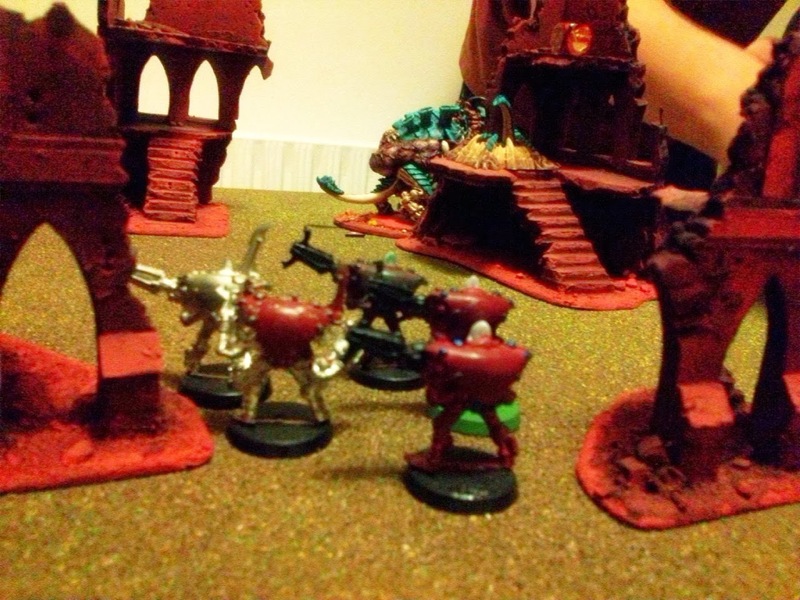 However the weapons platform is the nearest model and manages to soak up all my heavy hitting firepower from the Spore Pod and there are still 5 'fearless' Guardians left in control of the objective. 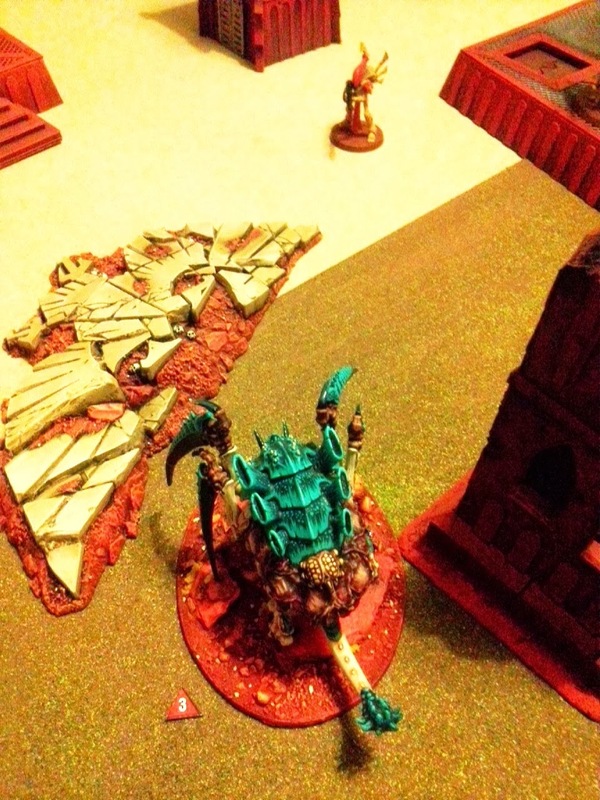 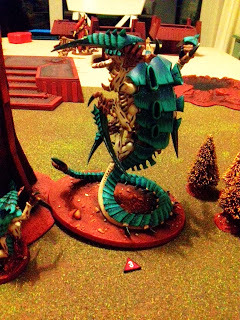 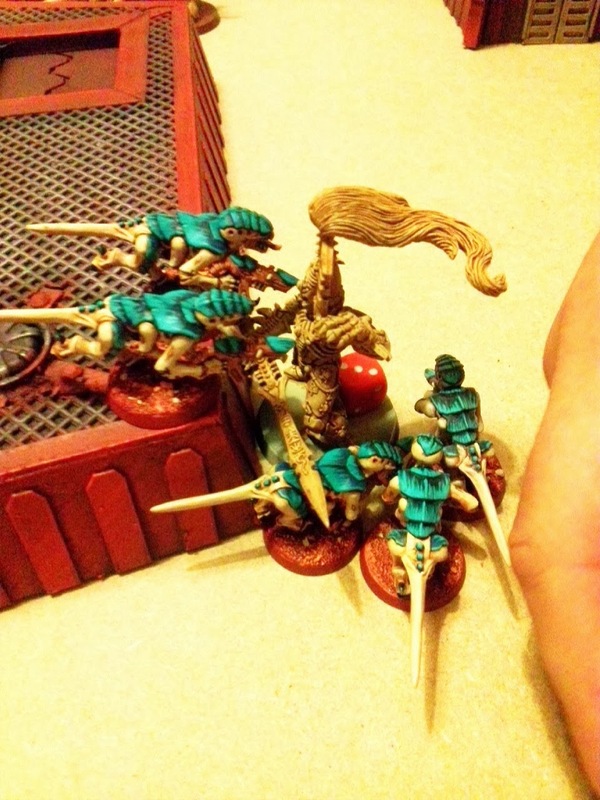 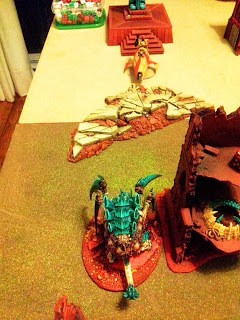 Only 1 Wrait Guard remains, having killed the other with Life Leech gaining a wound back on the Tervigon. 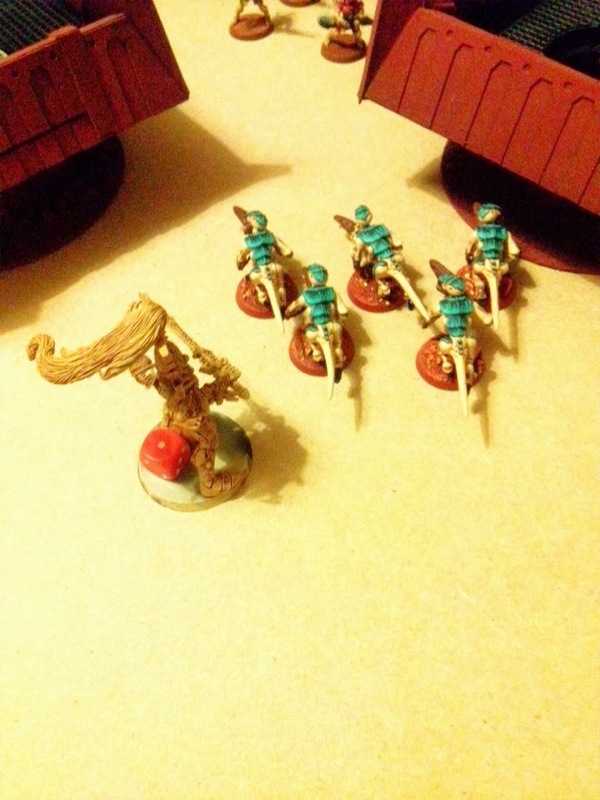 I think I must have killed the last one with a Stinger Salvo, given it's lack of presence when the Warp Spiders repositioned alongside the Jet Bikes. I seemed to think I could contain this situation, how wrong I was. The Avatar steps in to meet the Devgaunts who lose 5 to Shuriken fire. 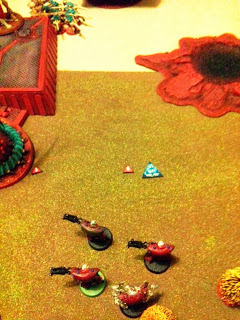 The Spore Pod is mushed by the Avatar's ranged attack. And the Tervigon is killed allowing the bikes to happily secure the objective. 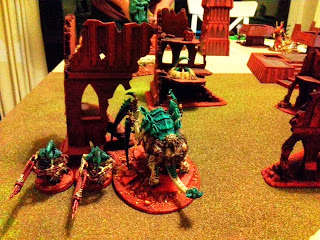 The Avatar is down to one wound, so close and then everything opens up wiping out the Devgaunts. 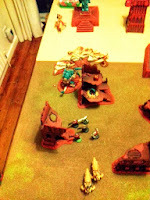 The only thing left on the table is a missed spore mine which was removed also - tabled. 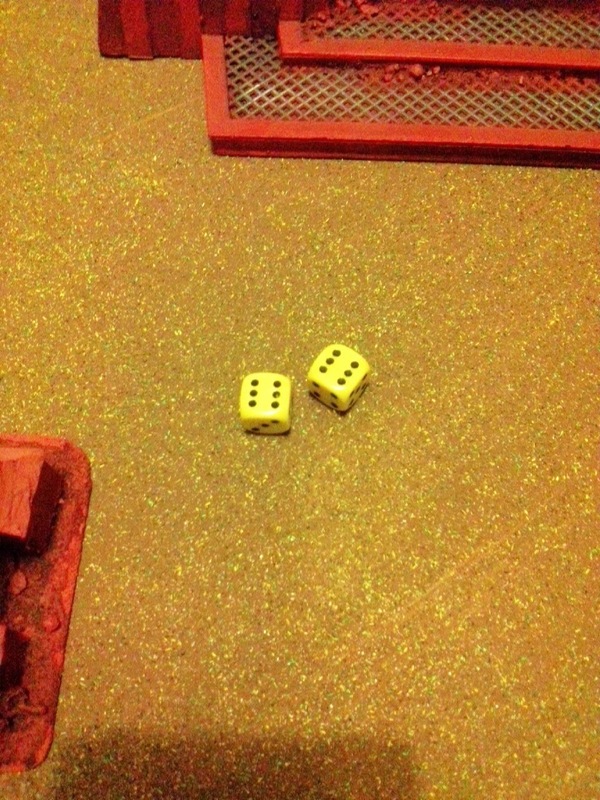 This was utterly brutal, everything I had was in the wrong place or the dice roll had put them in the wrong place. 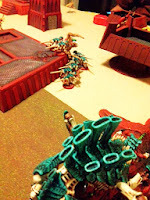 I have to say without Endurance or Iron Arm everything is so fragile, I think I'd been blessed previously with an abundance of those powers, making me more durable - without them and especially against weaponry that cuts through my armour save then you're resorting to moving from cover to cover and that slowed everything down. 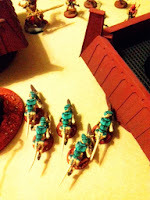 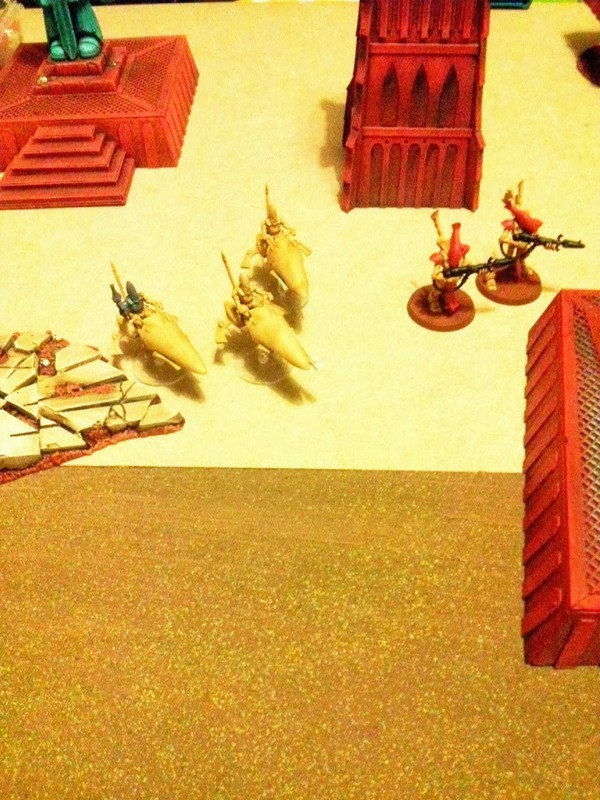 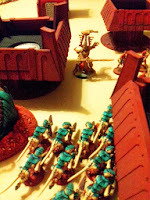 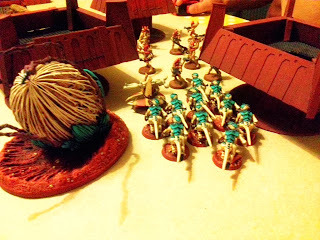 Even when most of the Eldar were on foot they seem to move, shoot and move so they end up being far more mobile than the so-called quick Tyranids.